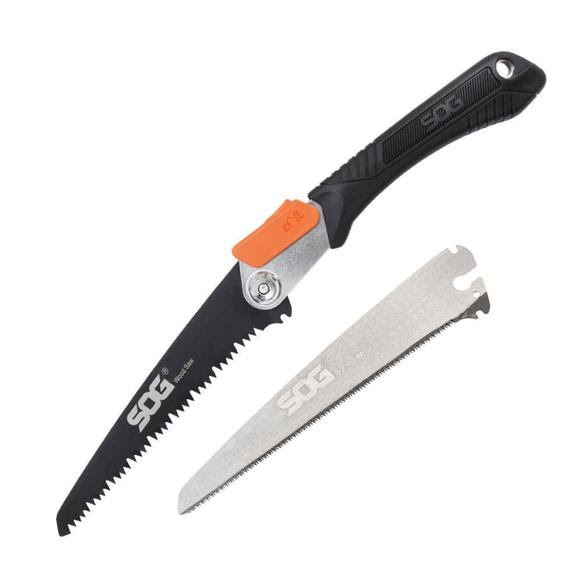 Designed in conjunction with hunters, outdoorsmen, and guides, the SOG Folding Saw meets and exceeds the needs of professionals and enthusiasts alike. Employing two 8.25-inch blades of hardened and tempered steel: wood saw and bone saw, it makes short order of whatever you are cutting. The wood saw is designed with deep gullets and teeth configuration that cuts on both push and pull stokes and bone saw to easily cut through branches and small logs, whether it is green or dry wood. It is essential to any outdoorsman. The bone saw has many small, sharp teeth to quickly cut through bone and other hard material. A good compact bone saw is a necessity for any big game hunter. When not in use, the saw locks closed for storage in the included pouch that also has an extra sleeve for the unused blade. When needed, the blade locks open ensuring there are no accidents. The rubber handle gives a sure, yet supple grip in all conditions while the solid stainless steel liners under the rubber to give the saw a strong, stable, and rigid feel. The blade can be changed easily, without tools, and done on the field with quick turn of the thumbscrew at the pivot. Take it wherever you go and the SOG Folding Saw will make quick work of whatever you are cutting through.